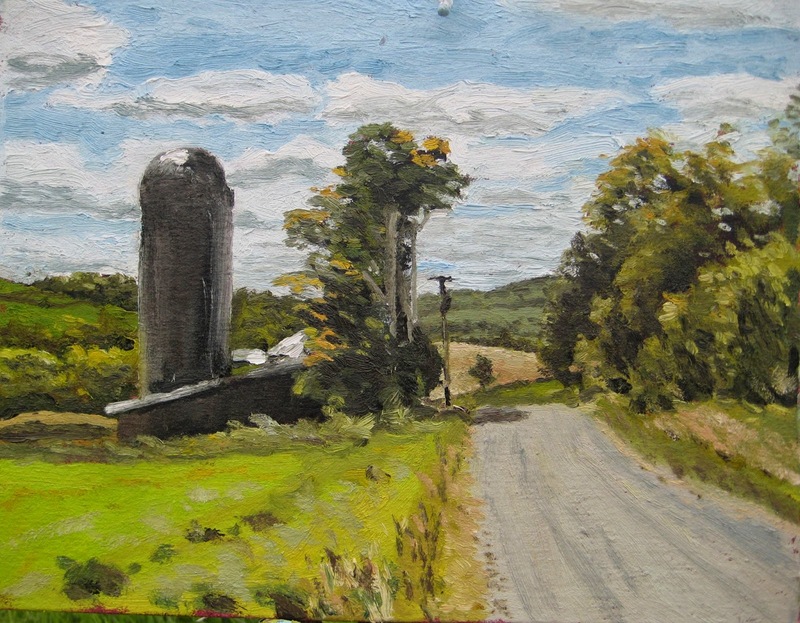 Matt Chinian Painting Blog: McCart Rd. third October in a row, composition video. McCart Rd. third October in a row, composition video. 67 cloudy to partly sunny. I've painted this scene three times at the same time of the year, for the last 3 year. I'll try to dig up those jpegs by the end of the blog. In the video I talked about placing the panel, and deciding how "big" the scene would appear within the frame, and then deciding what to include, up/down, left/right. Some use cardboard cut out rectangles, I'm too lazy for that, so I'll use something I can't forget, or sometimes a brush handle. This shows the horizon low with a large sky. This shows the scene to the left, just to illustrate the point I want to make, the elements need to make the composition work within the format of your frame. Where the horizon line falls, and the edge of the road intersects with the frame is crucial. There are no rules, but you know when it works. This is the first still I took of the process shots, I'm using prepared canvas, that's primed with burnt sienna, I don't like the smoothness of the surface, but I'm just about of panels, and I'm procrastinating on making the next batch, tomorrow! I don't like having the blue tape around the edge. 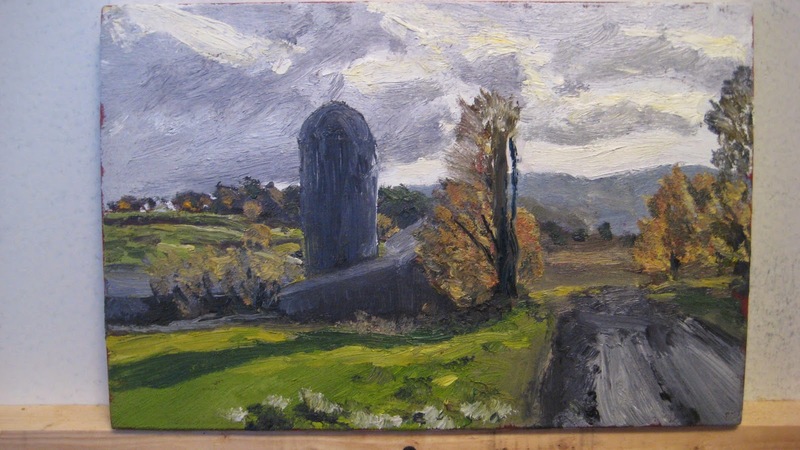 The sun kept lighting different parts of the scene at different times, I wanted the trees by the barn to be lit. Here is where I ended up and I was pleased with the light I was able to get. The light just kept on getting better, and although I didn't get a scene devoted to the bright yellow/orange of autumn, I do think this represents the season. Nice painting. And I like those of the others years as well. Thanks Chani! I liked seeing my "progress" over the years, in the same place/ time of the year, (although I'm a few feet farther back). I do think I've gotten better at getting the light/color accurate.